Interesting snapshots taken during the recent voyage of the intercolonial liner Monowai across the Tasman Sea from Sydney to Wellington, where she arrived on Monday evening of last week. Late on the previous Saturday night the liner Aorangi, bound from Sydney to Auckland, picked up a wireless message from the Finnish barque Favell, en route from South Australia to England, via Cape Horn with a cargo of wheat, asking if the Aorangi could go to her aid and take on board a sick apprentice who was suffering from appendicitis. To do this would have taken the Aorangi 200 miles off her course, and accordingly a radio message was sent to the Monowai, which was nearer the barque. 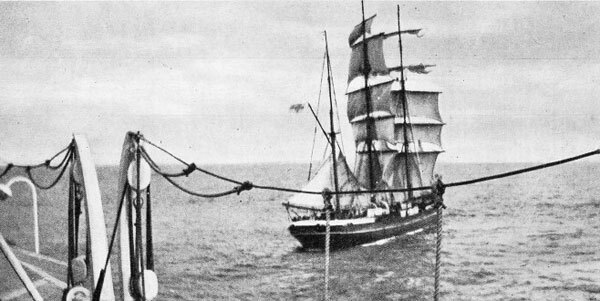 The Monowai, which was 200 miles from the Favell, had to go 180 miles out of her course, coming up with the barque early on the Sunday morning. 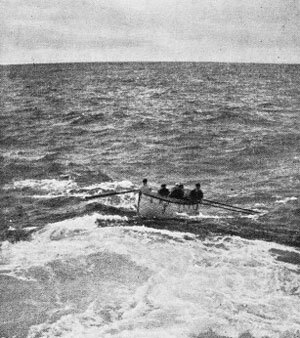 The sick man was transhipped and the Monowai headed for Wellington, arriving the next day four hours late. 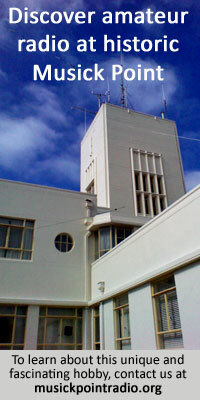 She then sailed for Wellington where the cadet was treated at the Wellington hospital. Monowai’s Captain, Arthur Davey, was awarded the honour of the “Knight of the White Rose” by the President of Finland for his services at a later date! It’s very interesting that the barque Favell carried radio equipment. 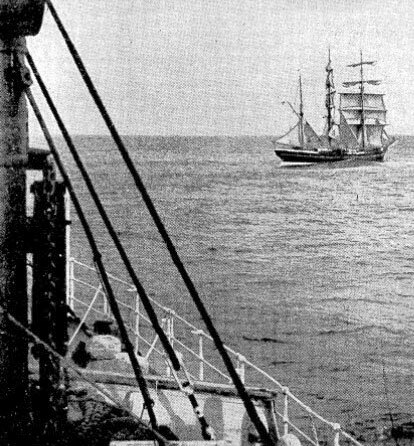 With the exception of the occasional cadet training ship, Finnish sailing ships of the twentieth century did not carry radio equipment. The only other windjammer sailing under the Finnish flag, that I know of, was the barque Viking, when she was used as a cadet training ship. 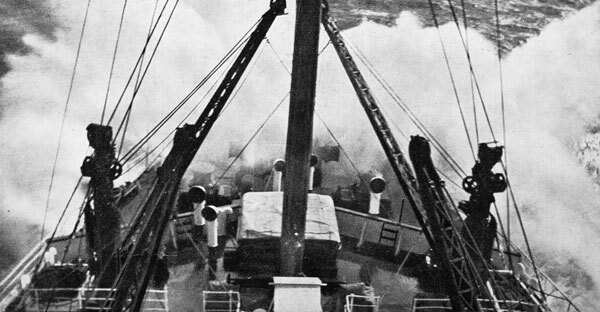 In 1934 Favell was being used as a cadet training ship. On her return to Finland, late in 1934, she was broken-up.